As the government hopes to introduce a new Yukon Liquor Act later this fall, one focus could be to mirror other jurisdictions’ rules across Canada – but don’t expect alcohol sales to hit grocery stores any time soon. That’s according to John Streicker, the minister responsible for the Yukon Liquor Corp. (YLC). He told reporters Monday afternoon one of the goals was to look at shifting the rules from a permissive act to one that is more prohibitive. Streicker said the work to update the 40-year-old act is very much under way. “In a permissive act; you say alcohol is permitted except where we prohibit it,” Streicker said. What that could mean on the ground level is ensuring that alcohol is responsibly consumed and sharing that role of curbing any irresponsible behaviours. While Streicker didn’t want to be too prescriptive ahead of the unveiling of the new rules, he did offer a brief example of somebody who is intoxicated in an area. Right now, the establishment can ask the person to leave, “but there are times when that might push them to drive in a car,” he said. That’s just one example how a social responsibility lens is being applied here, Streicker added, noting others include looking at the hours of operation for offsales and pricing. Looking at other areas in the country, such as Quebec and New Brunswick, which at points allowed consumers to buy things like beer and wine in grocery stores, the minister noted that may not be a good option for the territory. “I don’t think that is what I’m hearing back from the advisory group as being a way to go,” he said. Meanwhile, just below 60 per cent of Yukoners felt the access and availability of liquor through YLC store and offsales outlets is adequate, according to public engagement results made public last summer. The YLC currently operates six liquor stores in Haines Junction, Mayo, Watson Lake, Dawson City, Whitehorse and Faro, and has nearly 150 licensed liquor outlets that include offsales, restaurants, breweries and bars. Asked about the number of retail options for consumers to get their hands on liquor, 65 per cent of the survey’s respondents supported permitting grocery stores to sell some liquor products, such as local products. The minister was subject to questions in the legislature on Monday from NDP Leader Liz Hanson, who wondered of efforts to curb things like alcohol and drug abuse. She pointed to the YLC’s annual report from 2017-18 that placed a focus on leading social responsibility and other stats that showed those over the age of 25 collectively made 1,000 visits on average to the emergency department every year. Those visits were directly related to drug and alcohol use, which included withdrawal and acute intoxication, according to the 2015 Yukon Health Status Report on Substance Use. 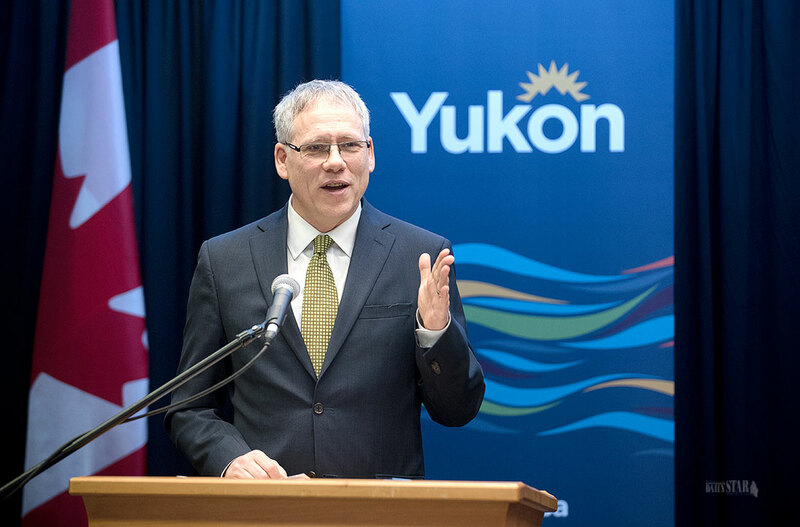 “There are things we look at; we put them in a Yukon context and we make a decision,” Streicker said – but the goal wasn’t to suggest consumption of alcohol is wrong in any way. “What we want to say is overconsumption of alcohol, where it leads to things like addiction, where it leads to things like drunk driving, where is leads to things like harms. He reiterated that it’s a shared level of responsibility to try to curb these harms when confronted with them. “It’s not appropriate for any of us to imagine that we don’t have some responsibility, whether that is individual Yukoners or that’s as government. The corporation offers things like hosting and entertaining tips to help drive responsible consumption, along with purchasing guidelines for wine, beer and spirits and other recipes. Streicker added the government is hoping to turn to the chief medical officer of health for advice once some of the rules have been drafted, ahead of this fall, when it hopes to table the new legislation. Thank you John and Sandy and your team for showing leadership on this difficult topic, often I see members of a certain political party of a blue colour imbibing to excess, this way they can relax a bit have some coffee and water and them go home safely! Alcohol abuse is not a new problem, it's been with mankind since booze was invented thousands of years ago. In all those many years, many have sought ways to prevent abuse by some consumers by creating rules for controlling the availability of alcohol. Motivated consumers will always find a way to get what they want, even if it means filling their bathtub with the makin's for their own brand of hooch. Government is trying to control the responsibility of liquor consumers by controlling the availability, price and consumption levels of the products. History has shown this approach does not work despite how many times governments of various kinds attempt it. So the merchants of booze in the Yukon will be given new operating rules that will have a direct impact on their businesses with the goal of addressing the issue of alcohol abuse by some consumers. The merchants will complain they are being hobbled by rules that do not support the greater world view and impacts on how our tourism industry is affected by not having liberalised (cough) liquor laws like in other countries. I expect the nanny-state permission/prohibition approach the minister spoke of will fail as all the similar variations on this theme have done before. You can't legislate against ignorance, self-abuse or a lack of personal responsibility, yet they keep trying all the same. Yeah, serve them coffee until they are wide awake drunk, then let them drive home. This is so unbelievably stupid I can't believe Streicker would even say it out loud. Yukon and Canadian Government makes a fortune selling liquor (taxes) and now legal drugs. They speak with forked tongues. Streicker and the rest of the Silver team reveal their authoritarian tendencies by their imposition of more/higher fees, bans and rules in almost every sphere of governance. "Responsible consumption". I can't wait to see what the closet prohibitionists have in mind for us plebs. "Keep them there, serve them coffee until they are OK to drive". Ya right, and who determines that, legally? Well, that’s decisive. And that will only be until someone complains, then no more rule changes.